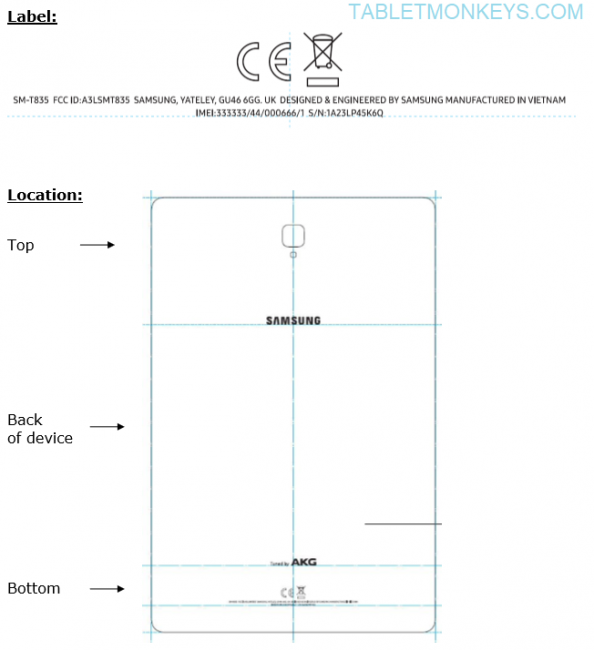 The Samsung Galaxy Tab S4 FCC approval was listed yesterday, which was filed in the 2nd week of June. And having cleared the FCC as the final regulatory body, Samsung’s Tab S4 is now ready to be launched this summer. Samsung Galaxy Tab S4 specs have been leaking at regular intervalls since February, so we’ve covered the main specs already, meaning that very little new on the S4 came out in the FCC approval, but we did at least get a confirmation of the dimensions of it. The 10.5-inch Samsung Galaxy Tab S4 (SM-T830/SM-T835/SM-T837) is indeed confirmed to sport a 10.5-inch display, and the exterior size of the S4 measures 249.3mm x 164.3mm, meaning that it’s just a bit longer than the first 10.5-inch Samsung Galaxy Tab S, but also not as wide, so that could mean that the bezels are slimmer than on the first Tab S, as dimensions of the first Tab S 10.5 are 247.3mm x 177.3mm. So Samsung will launch two 10.5-inch Android tablets in 2018, with the other one being the Samsung Galaxy Tab A2 Xl 10.5 (SM-T595). As evident by the Samsung Galaxy Tab S4 10.5 label submitted to the FCC, the Tab S4 just like the Tab S3 is still “Tuned by AKG” so the audio should be good, and we should be able to expect 4 speakers like on the Tab S3, though that’s just speculation on my part, as the only other new things confirmed for this upcoming Android 8.1 Samsung tablet were the USB Type-C port, and the new Samsung Galaxy Tab S4 keyboard with model number EI-FT830.